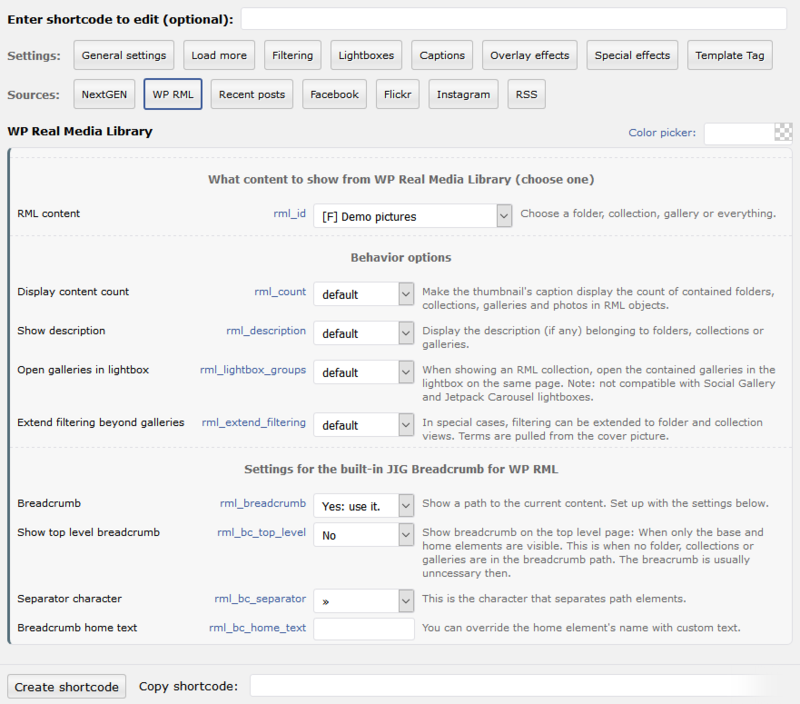 WP Real Media Library is the best way to make the native library useful. Collections hold galleries and other collections. 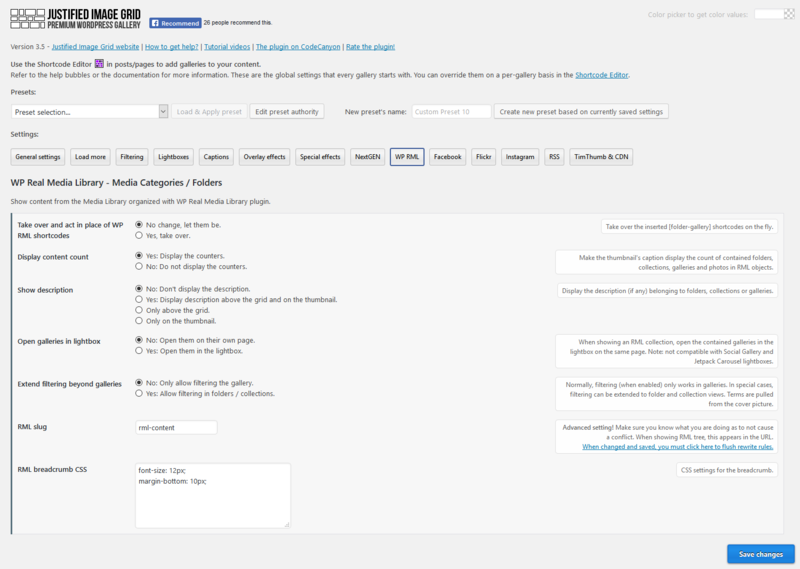 Easily show galleries that belong together or start a hierarchy. Instead of directly containing images, WP Real Media Library collections contain galleries or other collections. You never actually see collections, but only their contents as they just hold things together. Show them with Justified Image Grid but continue to use RML's interface to manage them and their contents. It's nice and easy with drag and drop. This example shows a collection called "Life". It contains 7 galleries and indirectly, hundreds of photos. Observe the breadcrumbs (once entered a gallery) and where the thumbnails link to. Load more and Filtering are just the icing on the cake. Are you interested in opening these straight to the lightbox instead of navigating the page? Take a look at the Galleries demo. How does showing WP Real Media Library collections work? Justified Image Grid makes no compromises whatsoever when working with RML. Thus it's one of the best album-gallery relationship content sources ever. Efficient database queries, breadcrumbs and a custom URL structure are complimentary. While this is a concept of RML, normally it's only for organizing, to make the native WordPress library neat and not messy. Without JIG, you can't show collections directly. JIG automatically creates virtual pages for each gallery or child collection and lets you traverse between them. The desired content will be loaded in place of the original gallery. Breadcrumbs let you know where you are at in the tree and offer a quick way to go back some levels. RML has no limit on how many levels you can use. What can be displayed on the thumbnails? The name of galleries and child collections. Photo count of a gallery, for example "48 Photos". Content count of a child collection, separately for each type. For example "2 Collections, 10 Galleries". JIG ensures that each gallery and child collection has a cover photo. If a tree doesn't contain any photo, it's skipped. Each contained gallery or collection has a link to its virtual path stemming from your original page. Order the contents of the collection using drag and drop in RML. JIG respects such order automatically. I like that breadcrumbs thing, what's the deal with that? Show or hide it. Also whether or not to have it on the topmost level. Change the separator character like arrows, slashes between path elements and optionally at the end. Re-write the home element or automatically get the name of your selected collection.